Anita’s First Three Months at BEEPL: Elasticity Experiences? Anita Chauhan (Anita) was an ambitious girl from a remote village, 15 kilometers from Gorakhpur, in Uttar Pradesh. Anita’s village was sparsely populated and was underdeveloped. For instance, it was not connected by a pucca road, lacked electricity and had just one primary school. Anita completed her schooling from Gorakhpur and graduation (engineering) from Lucknow. Thereafter, she pursued her MBA from the New Delhi Management College (NDMC). 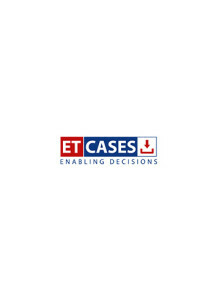 This caselet helps understand concepts in elasticity of demand through the experiences of Anita Chauhan (Anita), the protagonist of the caselet. As Anita embarks on a new phase in her life where she joins Blue Earth Engineering Products Ltd. (BEEPL) as a management trainee, she experiences episodes of elasticity of demand. As she takes decisions related to elasticity of demand, the students/participants get an opportunity to understand the concepts of price elasticity of demand, income elasticity of demand and cross elasticity of demand. I. Explain Anita’s residence selection and shopping for fashion apparel online with the help of concept and types of price elasticity of demand. II. Anita’s first salary undoubtedly changed her brand preferences. How do you categorize the new found demand for preferred brands of shampoo and lipstick? Explain with the help of the concept and types of Income Elasticity. This caselet is meant to understand three types of elasticity of demand - Price, Income and Cross Elasticity of Demand. Presented through a management trainee, Anita's first three months at her new job, this caselet presents several of her elasticity-related experiences. While her residence selection explains the price elasticity of demand, her changed brand preferences reflect the income elasticity of demand and her decision to purchase a two-wheeler highlights the cross elasticity of demand. Each of these episodes can be used to discuss and debate on the concept and contours of each of the three types of elasticity of demand. While each of the three types of elasticity of demand has sub-types, this caselet can also be used to examine the revenue relationships based on the elasticity type.